LodgeCraft offers hundreds of cabin and rustic table lamps, made from the finest American vendors (just look for the American Flag on the product pages). Many of our rustic and lodge style table lamps have several finish and glass lens options, so you can get the custom look you want. 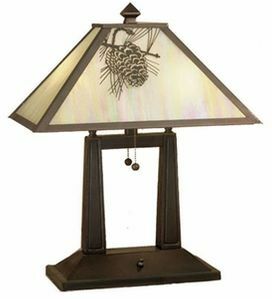 We also carry a huge selection of Tiffany-style art glass table lamps. Each art glass shade is handmade and imported to our manufacturers. Choose from the ever-popular rustic table lamp designs from Mica Lamp Company, Coast Lamps, Colorado Rustic Lighting, Steel Partners, Dale Tiffany, Quoizel and more. Whether you are searching for a western, cabin, mission, bear, or moose-themed table lamp, you name it, we have it. To ensure your satisfaction, our rustic table lamps are all hand-selected for their quality and exceptional craftsmanship. Rest assured that you are getting a lamp that will stand the test of time and be a great conversation starter. Thanks for choosing LodgeCraft as your preferred source for rustic and lodge style table lamps!